Are you ready for another way to WIN? If you have a blog, you can copy and paste the questions below into a post…all filled out with your answers, of course. Then make sure to link back to here, inviting others to participate in the party. Leave a comment here to let me know that you’ve completed your post. This will also let everyone know to go look at your blog to read your answers…kind of like a blog block party! You will receive 2 entries for participating on your blog, and one for every person who comes to the party, and leaves their answers, with your name as the invitee! If you don’t have a blog…don’t fret! You can answer the questions right here in the comments! You will receive an entry for you and for any friend who you’ve invited to come and play…cool, huh?! 😀 Let the games begin!!! What was your age when you first discovered your love of yarn? What (or who) was it that introduced you to all that fibery goodness? If you could sit down with anyone in the world to have a little knit along, who would it be? What is your favorite comfy place or position in which to work with yarn? Like our heroin in the story below, do you ever dream about soft fuzzy goodness? Or how to do a particular technique you’d never thought of while awake? What type of loomer/knitter/crocheter are you? Do you like long involved projects, or quickies full of fast satisfaction? Have you ever guiltily postponed dinner due to your involvement with a project? What is your ultimate goal in your yarn life? Do you have a favorite snack you like to munch while working with yarn? What is your all time most favorite yarn tool/accessory that you absolutely could not live without? What is your favorite book as an adult…and what was yours as a child? What are you working on right now with your yarn? Is there a special project that you’ve been just dying for someone (or yourself) to design? Did someone invite you to join in on the party today? This entry was posted in Blogging, Blogiversary, Contests, Crafting, Family Fun, Just Because, Knitting, Life, Loom Knitting, Movies. Bookmark the permalink. I was about 7 years old when I discovered my love for yanr. My grandmother shared her love of yarn with me. I would love to sit down with Isela to have a knit along. My favorite spot to curl up and loom is my lazy-boy recliner. Yes, I do have soft and fuzzy dreams of yarn and creating with yarn. I’m a bit of a beginner to looming. I want to loom knit socks. I love to crochet just about anything. I enjoy bead knitting bags. I like both fast and involved projects. I’m sad to say, yes. I have postponed dinner to finish that “one last stitch”. My ultimate goal is to be able to learn to needle knit and it look good and even. I don’t have a favorite snack to munch while working with yarn. My favorite gadget is my clover row counter. My favorite movie is “To Kill A Mockingbird”. My favorite book (so far) is “This Present Darkness”. My favorite as a child was the little golden book “Prayers for Children”. I’m presently working on a pair of crocheted slippers. I can’t think of a special project I wish someone would design. 1) What was your age when you first discovered your love of yarn? What (or who) was it that introduced you to all that fibery goodness? I was about 8 years old when my grandmother, and my mom showed me how to crochet! I loved it from the start, and began making very lopsided scarves, lol! 2) If you could sit down with anyone in the world to have a little knit along, who would it be? All of my loomy friends, of course!!! When are going to hold our own Loom Knitting Cruise???? 3) What is your favorite comfy place or position in which to work with yarn? I love to get on the couch or my bed, all propped up with pillows, with my feet up, of course. 😉 My yarn bag/basket is to the side of me, and my Katcha-Katcha row counter is right within hand’s reach. 4) Like our heroin in the story below, do you ever dream about soft fuzzy goodness? Or how to do a particular technique you’d never thought of while awake? As you may have guessed, lol, this particular phenomenon seems to happen to me quite regularly! The I-cord Blanket Edge Joining, and Bethany’s Booties were given to me while catching zzzz’s…and some more that I haven’t yet put to the test! 5) What type of loomer/knitter/crocheter are you? Do you like long involved projects, or quickies full of fast satisfaction? I’m a quickie girl, lol! Although I did really like to have the long project of the Pinwheel Blanket going, and doing smaller ones here and there besides. 7)What is your ultimate goal in your yarn life? I’d like to make/design sweaters for each of my immediate family members…I’d like to actually get to finish that afghan from the Loom Class 😉 and I would love to be involved in another book project someday. 8)Do you have a favorite snack you like to munch while working with yarn? Peanut M&M’s! 9) What is your all time most favorite yarn tool/accessory that you absolutely could not live without? I would have to say it’s my little pink bag…this is a make up brush bag from Mary Kay, that is just perfect for stashing all my absolute necessities…this little bag goes with me everywhere my yarn does! But INISIDE my bag, my favorites are my Katcha-Katcha row counter, and my wool needle by Pony. 13) Is there a special project that you’ve been just dying for someone (or yourself) to design? Sweaters for my family! I have some other plans too, but they’re in the dream/idea stage, lol. 14)Did someone invite you to join in on the party today? Me! 3.Um well I love to loom knit just about anywhere. I often do it while watching t.v. 5 well I love quickies and really anytype of project. I takes me a while to get into long ones, plus I often don’t have enough of one type. 6. Not really But sometimes I wish I cound skip dinner and loom Knit. 7. 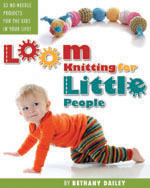 I want to knit a sweater and someday submit a pattern to the loom knitting online mag. 8. Candy any type of candy is great with me. 9.I could not live without my set of kk’s OH I use them almost every day. 10. My favourite movie is the phantom of the opera. It has great music. 12. I am working on a fluffy scarfn my looms for a christmas Present. 13. A sweater, A loom knitted sweater that would fit me. 14. I saw the invite on your blog and decided I must come. 1. I was first about 15 and a friend of the family was teaching my sister and I how to knit. Then I picked it up again at age 32 and wanted to try to teach my daughter. 2. It would be hard to decide but I found Isela Phelps site first when looking for loom patterns. 3. In my dad’s chair that he gave me with my feet up. 4. Some nights it is hard to fall asleep since I am trying to figure how something could be worked up. 5. I am a loomer who loves quick project. 6. Yes, all the time. Just give me 5 more minutes and next thing an hour has past. 7. To try to get as many warm items for my local foundation that hands out the items to kids. 8. Anything with chocolate and peanut butter. 9. My new yarn pick. 12. Baby hats and booties for New and Due baby Shower in Sept. I was probably in my 30’s when a friend tried to teach me to knit with a hook…….no way did I like it. On the couch by the lamp. I don’t have a favorite yet, I am still learning. Favorite movie is always the last one I seen. I loved Bambi as a child and still do! 1. What was your age when you first discovered your love of yarn? I was 26. 2. What (or who) was it that introduced you to all that fibery goodness? My wonderful Grandma when I was 8 years old. 3. If you could sit down with anyone in the world to have a little knit along, who would it be? Easy Elizabeth Zimmermann. She was a genious with the needles! 4. What is your favorite comfy place or position in which to work with yarn? I like to sit in my two sitter couch, I spread my yarn on one side and me on the other ;). 5. Like our heroin in the story below, do you ever dream about soft fuzzy goodness? No dreams of yarn hasn’t happened yet. Or how to do a particular technique you’d never thought of while awake? I did have a few revelations on how to do a few things with crochet and also on the looms while knitting. The brain never sleeps! 6. What type of loomer/knitter/crocheter are you? Do you like long involved projects, or quickies full of fast satisfaction? I like small, intricate projects…socks! 7. Have you ever guiltily postponed dinner due to your involvement with a project? I have had to postpone dinner a few times due to projects that were due. I much rather eat though…lol. 8. What is your ultimate goal in your yarn life? In yarn life…hmmm, to loom knit entrelac. 9. Do you have a favorite snack you like to munch while working with yarn? No. I don’t eat while I knit or loom. 10. What is your all time most favorite yarn tool/accessory that you absolutely could not live without? My row counter–mini kacha kacha. 11. What is your favorite movie? The Lord of the Rings set. 12. What is your favorite book as an adult…and what was yours as a child? As a child, I was unfortunate not to have anyone read to me or have books to read, at least not other than textbooks–life in Mexico doesn’t allow such luxuries. As an adult, I have read many books all in the Fantasy genre, I can’t really pick only one but I would read a hundred times the Alchemyst. 13. What are you working on right now with your yarn? Socks ;). 14. Is there a special project that you’ve been just dying for someone (or yourself) to design? Ummm, none come to mind. Okay, I posted this to my blog, this was fun! Bethany’s having a party and your invited! I think I was about 8 or 9 my Mom used to knit, I always loved watching her. She was very patient trying to teach me how to knit, but it wasn’t until I was married and on my own that I really took up the needles and have been knitting ever since. 2. If you could sit down with anyone in the world to have a little knit along, who would it be? All of the wonderful friends that I have met in the loom class. 3. What is your favorite comfy place or position in which to work with yarn? I really don’t have a favourite place, just pick up the loom and sit down wherever. 4. Like our heroin in the story below, do you ever dream about soft fuzzy goodness? Or how to do a particular technique you’d never thought of while awake? I always dream about learning new techniques and different stitches. 5. What type of loomer/knitter/crocheter are you? Do you like long involved projects, or quickies full of fast satisfaction? I like looming both type of projects. 6. Have you ever guiltily postponed dinner due to your involvement with a project? I plead guilty to this, more than once!!! 7. What is your ultimate goal in your yarn life? To live life to fullest and always be patient and caring to others. 8. Do you have a favorite snack you like to munch while working with yarn? 9. What is your all time most favorite yarn tool/accessory that you absolutely could not live without? 11. What is your favorite book as an adult…and what was yours as a child? Black Beauty as a child and Sylvia Brown books as an adult. 12. What are you working on right now with your yarn? I working on Christmas decorations for the grandchildren. 13. Is there a special project that you’ve been just dying for someone (or yourself) to design? A lacy looking sleeveless summer top. 14. Did someone invite you to join in on the party today? Learned about it from the group messages. 1. About 7 or 8 when Mom taught me to crochet. 10ish when a classmate taught me the very basics of knitting. 2. So many that know so much! Isela, Ann Bipes, Denise Layman, our own Bethany to name a few. 3. Ever since breaking my ankle in early January, most of my looming has been done propped up against one of those big pillows with the arms, in/on my bed. At first it wasn’t a choice, but now I just like working there. 5. I like some of each. An ongoing larger project with the quickies for instant gratification works well for me. 7. Haven’t given this one any thought. Maybe just to do the best job I can on whatever project I’m working on at the time. 8. I don’t snack while working with yarn or fabric. 9. Right now it’s my small totebag I ordered from CreativExpress. Just the right size to carry a smaller project and not have it get in the way of others. Of course there are all the items tucked into the pockets. Stitch markers, row counter, etc. 10. No particular favorites. Not much of a movie fan. 11. As an adult, What’s so Amazing About Grace. Don’t remember as a child, but as a tween the Albert Payson Terhune collie stories. 12. The armshair caddy and the afghan squares. Need to get working on a baby blanket for a gift. 13. Not that I can think of. 14. Bethany via her invitation to the group. 1.Some old Lebanese women who worked in a family store taught a younger sister and me to knit. I was probably around 12 or 13. 2.I would like to knit with this sister. She is a hoot and we would have a great time. Connecting with family is awesome. 3.In my chair with my feet propped up. 4. No dreams about yarn, yet. I have dreamed about finishing projects, though. 5.I just like projects which I can learn new skills. 6.Oh, yes. Sometimes I even stay in my nightie all day with my nose in my loom…..just ask my husband. 7.I would really like to be an expert in looming and do any project with ease. 8.Hot coffee or a latte. Chocolate. Anything chocolate. 9.I could not survive without my Clover row counters. I have 3 of them. 10.Movie? I am a huge “Grease” fan. I have the sound track on my MP3 player. 11. The Velveteen Rabbit is a favorite of mine. As an adult, my favorite is The Five People You Meet in Heaven by Mitch Albom. 12. I’m working on the afghan squares, some dishcloths, and slippers. 13. Can’t think of anything right now. 14. Bethany. BTW….She is the one who taught me to loom knit at our local community college. I put all blame on her for my addiction to looming and yarn. Thanks, Bethany, for the gift of sharing your love for the art with me. Hey there Bethany 🙂 I put your fun questionnaire up on my blog. Thanks for the great party! Graciela, Bethany, Stephanie and Karen. 5. both; quickie for the breaks to get back to the longies. 8. Don’t get me started but CrackerJacks is one. 9. My frog clicker counter from Scout. Isela’s towelette and Block 7 for Loom Class. I posted my answers on my blog. Thanks for a great blog party!!! Hmm I copied it and put it on my blog! Check there! 1. I remember being about six or seven and sitting on the floor at my mother’s feet finger crocheting long chains, while mom crocheted poncho’s and vests and other essential seventies accessories. 2.Actually my friend Dawne. She’s moved away and I miss her. We’ve both taken up yarn crafts since then. 5.Both. I love a challenge and learning new things, but sometimes a quick knit is fun. 8. Knitting actually keeps me away from snacks sometimes. 9. Don’t have one yet. 11.Oh I just can’t choose. I love too many books. 12. I’m making loom adaptation to the EXTERMAKNIT (dalek) pattern–for all you Dr. Who fans out there. I am late for the party (it’s a big family thing), but hey, at least I made it! My answers are on my blog! Just wanted to come by and let you know JackieA invited me to visit your site. Though I am not a yarn crafter, I do enjoy seeing what others are doing. Thanks for sharing. 1. What was your age when you first discovered your love of yarn? I was 46 when I started with the KKers. 2. What (or who) was it that introduced you to all that fibery goodness? I would have to say my neighbor Bev…she is always crocheting something and I have been envious till the KKers came along. 3. If you could sit down with anyone in the world to have a little knit along, who would it be? My Little Grandmother who passed in 1967. I have a few pieces of her crochet projects. 4. What is your favorite comfy place or position in which to work with yarn? I like best sitting on the couch. 6. What type of loomer/knitter/crocheter are you? I like to do the quick things but I long to do a sweater. 7. Have you ever guiltily postponed dinner due to your involvement with a project? Yes but knot with my knitting…yet! 8. What is your ultimate goal in your yarn life? To be able to knit a sweater. 9. Do you have a favorite snack you like to munch while working with yarn? No, as I would have whatever I was eating mixed in with the stitches. 10. What is your all time most favorite yarn tool/accessory that you absolutely could not live without? I would have to say the looms them selves as I could not knit myself out of a bag with needles. 11. What is your favorite movie? There are really too many to name just one…but this week it is: Fool’s Gold. 12. What is your favorite book as an adult…and what was yours as a child? As a child, I would have to say “the thing at the foot of the bed”. I checked it out at the library over 20 times and when they got ready to discard it I got to keep it. As an adult, Anything by Danielle Steel. 13. What are you working on right now with your yarn? Which loom? I have three of the blocks started and then also a kissey fish. 14. Is there a special project that you’ve been just dying for someone (or yourself) to design? A XL Tanktaop made on regualr looms. Thanks Bethany, for the party! I was late, as usual… but fun never the less!!!! Is it to late to join this fun party? I had no computer yesterday (boohoo). 1.I was 6 when given a spool knitter and apple pie knitter and kenner knitting machine. Since then I have been off and on with yarn.8th grade when I learned to needle knit. 2.My next door neighbor (babysitter) Mrs. Berry taught my sister and I to crochet. I liked the looms better back then already. I still have my spool knitter and plastic crochet hook and the yarn. It is Red Heart multi-color brights. Red, green, blue, orange etc. I made the longest snake ever. All my boys have knitted on it. It is longer than the length of my house. I planned on making a braided rug-it is still the longest UFO ever. I have worked on it for over 45 years now. Talk about never finishing somethings. 3. I would want to sit and knit with all of you but maybe Julia Roberts and Russell Crowe too 🙂 a girl can dream right? 4.My recliner chair is the best. 5.Once I figured out a pattern in a dream but no creations just mine. 6.I would say intermediate all all fronts,knit, crochet and looming. 8.Ultimate dream, intricate lace and socks for everyone. 10.My mystery pouch we made last year-it holds it all. Adult: I like the needle mysteries (Died in the Wool,A Deadly Yarn, Needled to Death, Knit One Killed Two, Knit Fast Die Young, and the knitting books by Debbie Macomber).A bit yarn obsessed right? 14.I would like a circle lace shawl like needle knit patterns have. I got it posted on my blog. I’m not a “blogger” and this is the first blog I’ve been in. Jackie A. invited me. I’m a baby beginner in looming. But I find I enjoy it and hope to learn more. I have completed a stocking cap for my granddaughter and am now working on an afaghan. Thanks Jackie A for inviting me and I’m sure I’ll be back. Looking at all the patterns and what other have to say is very interesting.